I have often said if there were a single website on the face of the planet that I wish I had come up with (assuming it was purely for fun) it would be Onebag. The idea being, how can you reduce your total travel needs down to a singular bag, which has all sorts of benefits for travelers. I really really like this idea, as it fits closely with the Smartphone Exec lifestyle. There are three major things to think about when you’re thinking through what to pack. Can it serve more than one purpose? Does it have at least two functions? If not, then it should probably not get packed unless it’s very very important (insulin or contact lenses or whatever). Basically the more uses you can get out of something the more likely it will get packed. Find the lightest version possible, or re-package it into a lighter package where it makes sense to. There’s a lot of heavy items out there that have lighter weight versions. You don’t want to be lugging around an anvil in your bag, even if it will fit. Find something that doesn’t take up much space. If it’s small, then it’s a better candidate for travelers. If it can shrink when not in use, or after use, even better (for instance an air pillow). Since I brought up headphones yesterday with regards to Apple possibly doing away with the headphone jack entirely, I thought this would be a good follow-on post. When I started traveling, I realized that I had to get some better headphones. The ones I had at the time weren’t noise cancelling and the difference between something that does and doesn’t cancel noise on an airplane is significant. Less noise is better quality of sleep, less distractions when you’re writing things, and frankly, a less annoying experience all around. My first noise cancelling headset was an early Sony model that rivaled the Bose headsets, but were a bit cheaper. I didn’t notice any significant difference between the two and was told the over-ear model would reduce vibrations on the ear and make substantially more quiet than anything that could fit in your ear. The in-ear models were a gimmick more or less. I kept that model for several years and had no major complaints until I switched to using only one bag. Then I started looking at other options. I’d be willing to sacrifice a little noise for a lot less space in my bag. As you can see in the photo above, it is substantially smaller, allowing me to fit a lot more in my bag. It weighs significantly less. 93 grams vs 425 grams. That’s a huge weight savings. It doesn’t use AA batteries, it charges off of USB, which means I can use the same charger for my phone, as my headset. That’s less extra stuff to carry with me – no physical batteries, no having to go and find/buy them, or have a separate recharging system, which is all added weight and size. It can double as a wireless headset to make calls, as it has a built in microphone. That means it provides double duty, where my old Sony headset has no such feature. That also means I don’t have to carry the iPhone headset anymore – another weight/space savings. It doesn’t make sleeping harder by pressing on my ears when I get a window seat. I find the over ear models are way less comfortable when you’re trying to sleep. The sound quality is surprisingly even slightly better than the over-ear model. 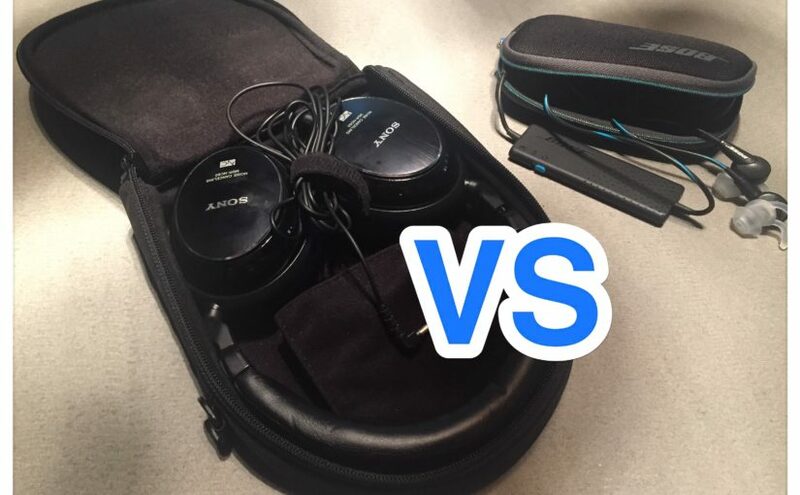 That may not be a fair comparison, because the Sony headset is an older model, but the quality is good enough that I don’t miss the Sony headset’s sound isolation at all. The Bose is actually slightly better if anything, which I still find amazing even after having it for months. If you’re interested you can find the QuietComfort headset on their website. It’s pretty good. But if we do move to a Bluetooth only world, we’re going to have to revisit this issue and find a suitable alternative.